Is your iPhone feeling a little naked? It's time to show some flesh, er, skin. Protect your iPhone with one of our colorful Hawaiian and surf style vinyl skins from our Society 6 online store. Shown above: Our Kailua Hibiscus iPhone skin. Click the image above for details. Our iPhone skins are thin, easy-to-remove, vinyl decals for customizing your device. They're made featuring a patented material that eliminates air bubbles and wrinkles for easy application. You can swap out from one skin to another in seconds. Shown above: Our Tandem Surfing Hawaiian Surfboard skin. Click the image above for details. Shown above: Our Mermarilyn mermaid with surfboard skin. Click the image above for details. If you like giving your iPhone a new look every now and Zen, our skins are an affordable way to protect it, and make you the talk of the town. So go ahead. Show off some skin. 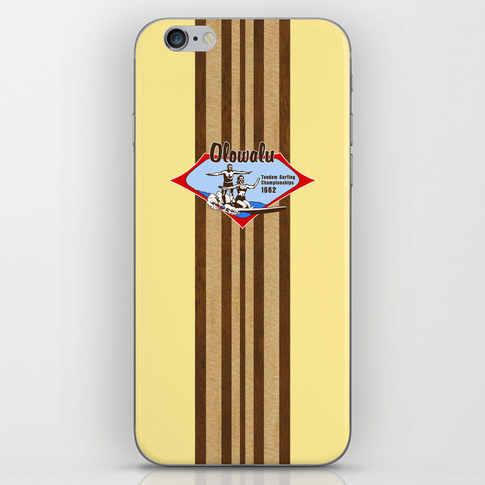 Shop our Society 6 online store for all our iPhone and iPod touch model skins. Your iPhone will love you for it. Mahalo! Welcome! You’ll see postings about what we’re doing, what we love, products we’re excited to share with you and topics that we hope will interest you. It’s our place to be eclectic and not just focused on shamelessly hawking our Hawaiian themed products. Our blogs are meant to enlighten and amuse. Yes, we’ll post the obligatory stuff about a new product, and we hope that you love this as much as we do. But we try our best to live aloha for all that this means, and we want to use our blogs to share a little aloha with you. A big mahalo to you!